Rembrandt (Dutch 1606–1669) is generally considered one of the most significant figures in western art history due in part to his virtuosity, the variety of his subject matter, and the sheer volume of work he produced in his fifty-year career as a painter, draftsman, and printmaker. Although his paintings garner the most critical attention, his prints demonstrate the same brilliance, diversity, and vitality. This exhibition brings together many of Rembrandt’s most significant prints and those created by several of his contemporaries, all of whom were active during a period called the Dutch Golden Age—a period marked by tremendous economic grow and artistic achievement. Arranged thematically, the images in this special exhibition explore key topics that inspired artists of the 17th century including landscapes, scenes of everyday life—or genre scenes—religion, and portraiture. The works also demonstrate the artists’ preference for a specific type of printmaking process called etching, a process that resembled the immediacy of drawing, required less technical preparation than the woodcut or engraving processes, and yielded multiple prints or impressions from each etching copper printing plate. Rembrandt and his contemporaries recognized the medium’s potential to satisfy a thriving market demand for innovative, affordable, and portable works of art. After all, “printmakers are the heralds and trumpeters of an artist’s fame,” stated Samuel van Hoogstraten. This was certainly the case for his Dutch master, Rembrandt, whose artistic status during his lifetime was based on his innovative, masterful, and highly sought-after prints. An avid print collector himself, the artist knew the power of this media in establishing his reputation beyond Amsterdam and the Dutch Republic. Rembrandt’s prints were widely circulated among collectors in the Netherlands and abroad and stimulated demand for his work and cultivated his reputation as a superior artist. 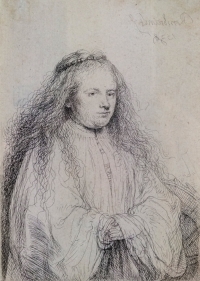 Rembrandt, The Jewish Bride (Saskia as Saint Catherine), 1638, etching on a paper. Purchase, Friends of Art, 10754. A prolific printmaker, among his most compelling images on view in this exhibition are his portraits. Fascinated with his own image, which he depicted nearly eighty times throughout his long career, Rembrandt also portrayed family members, fellow artists, intellectuals, and art connoisseurs. Influential men sought self-definition within the Dutch Republic’s unique political and economic atmosphere and Rembrandt’s portraits go beyond mere documentation, they are intimate and thoughtful psychological studies conveying a great deal about 17th-century society, its values, and its culture. From an old pancake vendor at her griddle, to a doting sculptor in his studio, from a mysterious noblewoman dressed in the latest fashion, to a beleaguered beggar walking the street, these various subjects are collectively referred to as genre. Highly descriptive scenes of everyday life, these images enjoyed enormous popularity in northern Europe, particularly among the 17th-century Dutch. Artists including Rembrandt elevated what was often regarded as humble or coarse subject matter to new heights, making these irreverent and descriptive prints highly desirable, so much so, that their popularity rivaled historical imagery. 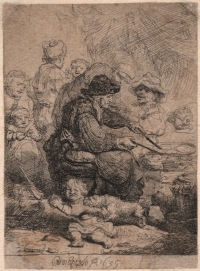 Rembrandt, The Pancake Woman, 1635, etching on laid paper. Gift of Mr. Frank E. Miller, 1989.090. Image courtesy of Syracuse University Art Galleries. Genre scenes created during the age of Rembrandt were inspired by the previous generation including the popular and widely disseminated print series The Beggars, 1620-23, by Jacques Callot. While Callot satirized panhandlers and beggars, Rembrandt humanized the poor and needy, and conveyed their weariness and desolation with dignity and compassion. The human condition interested Rembrandt and he found inspiration among the aged appearance, exhausted expressions, and tattered clothing in his picturesque figure studies. Rembrandt’s dramatic and eloquent portrayals of Amsterdam’s destitute, bear witness to the less visible members of the Dutch Republic. Rembrandt and his contemporaries often created innovative and compelling scenes from the Old and New Testaments. Highly regarded for the manner in which he portrayed his subjects, Rembrandt’s etchings demonstrate a deep compassion and empathy for the human condition. But what were Rembrandt’s religious beliefs? Remarkably little is known about Rembrandt’s faith. His religious prints reveal a keen understanding of scripture, yet surviving records do not reveal his fellowship in any one church, and he left no written account of his faith. Like many 17th-century Dutch artists, Rembrandt likely approached his religious paintings and prints based on their marketability rather than on any personal testimony. Yet throughout his career he returned to Biblical themes, which blended Catholic, Calvinist, Remonstrant, Mennonite, and Jewish beliefs, reflecting the complex and diverse religious environment in which he lived and worked. Practical and ideological considerations dictated a considerable degree of religious tolerance in the Dutch Republic during the Golden Age. Despite the fact that official documents referred to Calvinism as the only true Christian religion, attempts to accord it the status of a state church proved fruitless, since at least one out of three Dutchmen held other religious beliefs. In 1672 one-third of the population of the Republic was Catholic, one-third was Calvinist, and the rest were either Jewish or members of dissident Protestant movements. Rembrandt, Landscape with a Cottage and a Large Tree, 1641, etching on laid paper. Gift of Mr. Cloud Wampler, 1963.0923. Image courtesy of Syracuse University Art Galleries. Dutch painters of the 17th century are credited with “discovering” their own surroundings—and, for the first time, naturalistically depicting their countryside’s vast panoramas and meandering waterways. The popular adage, “God created the world, but the Dutch created the Netherlands,” suggests the significance they placed on their natural environment and their unique role recreating their nation. It was during the Dutch Golden Age that signiﬁcant land reclamation projects throughout the Netherlands recovered substantial tracts of land from inland seas and reshaped their holdings. While the previous generation of artists sought inspiration in the landscape only to fabricate ideal and imaginary scenes, Rembrandt, and a few of his contemporaries, turned to their unique geography out of a nationalist impulse to celebrate, as accurately as possible, its unique farms, cottages, and waterways. And yet, traditions endured, and an even larger group of landscape artists traveled to Italy. Mainly from Utrecht, a largely Catholic city with strong ties to Rome, the Dutch Italianates, as they were called, created romantic depictions of shepherds navigating rugged terrain and peasants visiting noble ruins. These expatriates influenced their Dutch colleagues, even those who never left the Netherlands. The idealized landscapes of Anthonie Waterloo, Jan Dirksz Both, and Karel Dujardin contrast sharply with the humble and natural terrain documented in Rembrandt’s prints.